Rico Royal reeds in strength 2.5 combine the features of the traditional Rico cut with a stronger spine and a "French file," allowing for more resonance and harmonics in the sound. 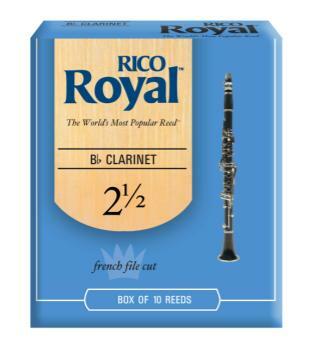 Rico Royal reeds have a more traditional French filed cut for increased response, especially in the low register, adding clarity to the tone and making soft attacks easier. Available for the full range of saxophone and clarinet voices and conveniently packaged in boxes of ten reeds.